Joshua Norton, the self-proclaimed Norton I, Emperor of the United States and Protector of Mexico, was San Francisco’s original eccentric, the man who set the tone for the city that San Francisco was to become. From our very early days, the Emperor championed the downtrodden, the meek and the oppressed, from the city’s Chinese and other minority communities to its laboring classes. The Emperor started out as a Gold Rush speculator. An immigrant from England, he spent his early life in the South Africa and came to San Francisco in 1849 to cash in on the riches of the greatest single human migration in history. As thousands of fortune hunters poured into the burgeoning city to seek their fortunes hauling “the color” out of the Earth, Norton went the smart route, selling goods and services to them. Arriving in the glorified mining camp that was the nascent city with an inheritance of $40,000, Norton set up shop and tried to corner the Peruvian rice market to feed the hungry Argonauts. Some said it was madness. Others, inspiration. Until the end of his life in January 1880, Norton reigned supreme on the streets of San Francisco, taking bows from admirers, handing out his own promissory notes, and writing proclamations. 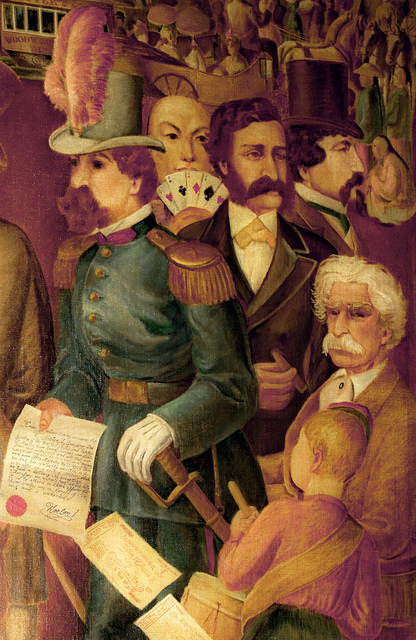 Detail from mural in San Francisco's Palace Hotel, depicting Emperor Norton, Mark Twain and Bret Harte | Painting by Antonio Sotomayor (1904-1985). Photo © Scott Cox, 2011. Why Norton and the Bridge? Whereas, we observe that certain newspapers are agitating the project of bridging the Bay; and whereas, we are desirous of connecting the cities of San Francisco and Oakland by such means; now, therefore, we, Norton I, Dei gratia Emperor, do hereby prohibit the Ravenswood scheme being carried into effect, and order that the bridge be built from Oakland Point to Telegraph Hill, via Goat Island. Over the next few months, into the summer of 1872, Norton made two more proclamations supporting the bridge concept. In short, Norton was a thought leader. In a very real sense, Emperor Norton was the original “brand ambassador” for the City. Nearly everything that we think of as San Francisco today stems from his original eccentricity. From the early bohemians and artists of Coppa’s to our free and easy speakeasy days to the beats, the hippies of the Summer of Love and the early pioneers of the Internet on The Well, San Francisco has embraced the wild, the madcap, the out-of-the-box, and Norton is our lodestar and guide. Let’s make history by naming the San Francisco-Oakland Bay Bridge for Emperor Norton. It will be fun. The late Michael Mattis (1964-2014) was a writer and a Renaissance man — a true Romantic of the American West who was a member of the Ancient and Honorable Order of E Clampus Vitus, as well as a modern-day dandy who knew his way around a bespoke suit. Michael was a founding member of The Emperor's Bridge Campaign and is the Campaign's first Member in Memoriam.